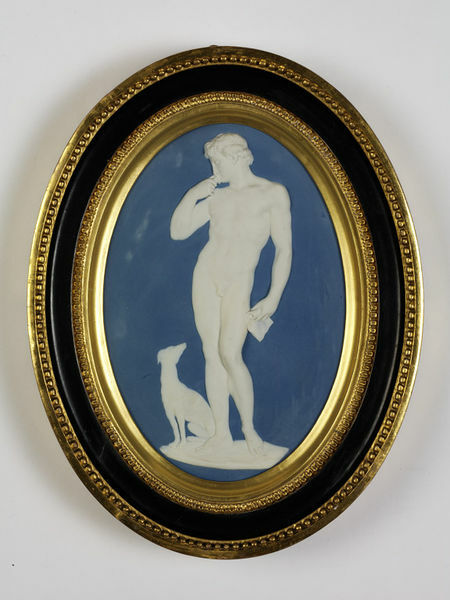 Oval plaque of blue jasperware with white relief decoration of a full-length figure of a naked man facing left and holding a seal to his lips with his right hand and a scroll in his left. A hound is at his feet. Moulded and beaded gilt wood frame. Height: 21.6 cm approx., Width: 14.9 cm approx. 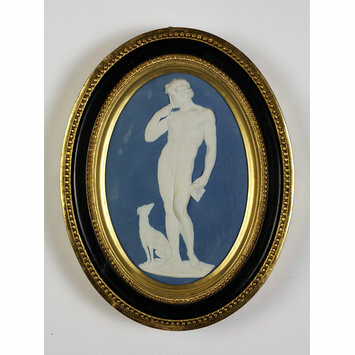 Oval plaque of blue jasperware with white relief decoration of a full-length figure of a naked man facing left, Wedgwood and Bentley, England, ca. 1755-1780.